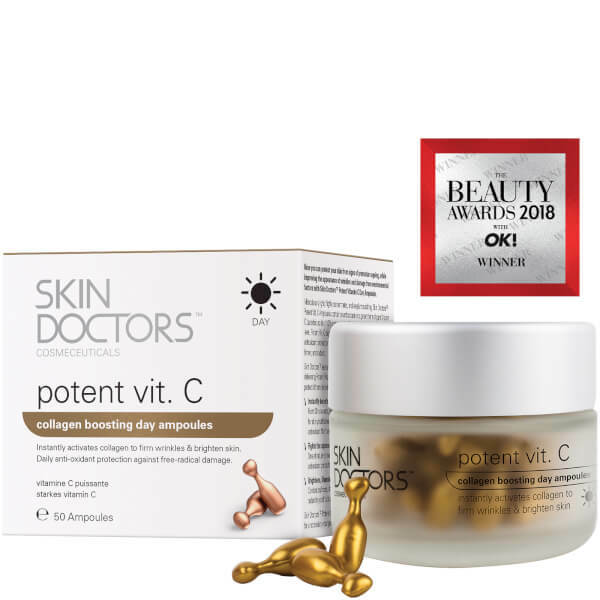 Rediscover your skin's youthful capacity with Skin Doctors potent vit. C Ampoules, a pure, concentrated anti-ageing treatment encapsulated within 50 single measured dose ampoules. 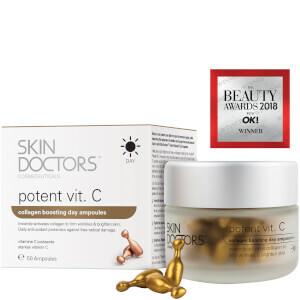 Packaged in air-tight ampoules to protect efficacy, the anti-ageing treatment contains a potent form of pure Vitamin C (Ascorbic Acid) at 10% concentration, which delivers hydrating and antioxidant properties to protect skin against environmental aggressors and leave it feeling firmer and illuminated. Delivering instant and cumulative effects, each dose will encourage collagen and elastin production whilst fighting the appearance of fine lines and wrinkles to promote a younger-looking, supple complexion. Lightweight and deeply nourishing, the formula will leave the face feeling smooth, soft and hydrated with improved firmness and radiance. Use one ampoule on cleansed face and neck every morning. Twist or snip ampoule neck to open. Apply by lightly tapping the serum onto the skin. For best results use in conjunction with Skin Doctors potent vit. A Night ampoules. Cautions: Do not ingest ampoules, topical product only. Always patch test 24 hours prior to use. If irritation occurs discontinue use. Do not use on broken or irritated skin. Avoid getting this product in your eyes, if you do, rinse thoroughly with water. Keep out of reach of children.